Page updated 14 January 2012. 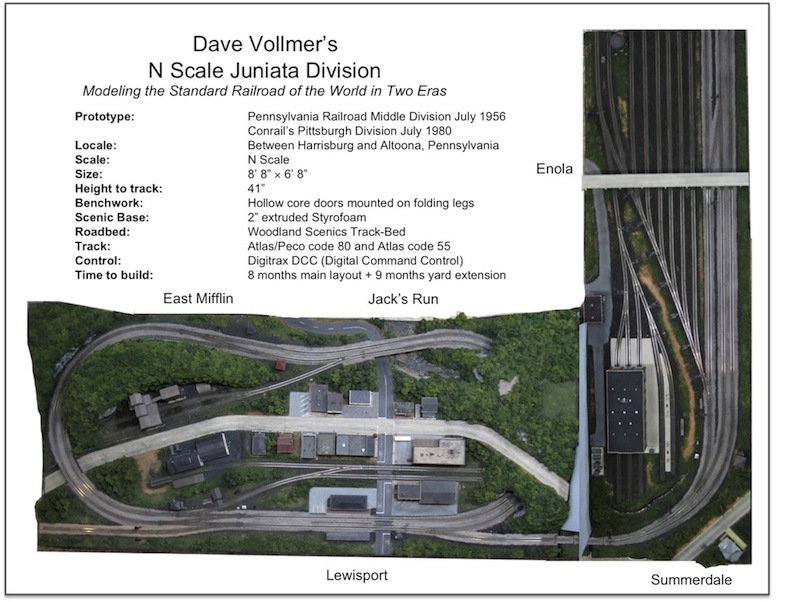 Note: All photos, videos, and images (except for the Pennsylvania Railroad and Conrail logos) contained herein are Copyright 2006-2012 Dave Vollmer and may not be used without permission. Here's the entire layout as it exists in January of 2012. The left hand portion is the original built on a 36" x 80" door. The right hand portion is the new yard, representing Enola, PA, on a 24" wide door. This is my fourth layout and the second representing the PRR in N scale. My last layout depicted PRR coal operations around Shamokin, PA in the summer of 1956. The new layout, like the last, is built on a 36x80" hollow-core door with folding legs. The new layout seeks to correct some of my mistakes of the last, and depicts a fictional segment of the PRR in central Pennsylvania inspired by the Middle Division - rather than Northern Division - operations. The layout is called the "Juniata Division (pronounced jōō' nē - āt' ə)" after the Juniata River followed by the real PRR's Middle Division from Duncannon to Altoona, PA. The real PRR Middle Division became part of Conrail's Pittsburgh Line in 1976 after the Penn Central failure. I've recently started building a Conrail roster to simulate Conrail operations circa 1980. The left hand side of the trackplan above is based on one Lou Sassi did in Model Railroader in the early 90s (and in the Second Edition of Kalmbach's Small Railroads You Can Build) called the Mohawk Valley. I changed a few sidings and industries, but otherwise kept the general concept intact. I also added a yard with an engine terminal on the right in 2009. Recreating an actual location on the Pennsy's four-track Broad Way of Commerce would have been difficult in my limited space. Instead, I've chosen for now to model a fictitious segment of the PRR (until that wonderful day when I can accurately recreate the PRR in that dream basement) and am attempting to capture the essence of the PRR's Middle Division. I tried to make the towns "sound" Pennsy, such as East Mifflin, Jack's Run, and the main focus, Lewisport (a combination of Lewistown and Newport, both on the Middle Division). Even the mine is "almost right." The PRR served 42 Berwind-White Eureka coal mines (and hauled Berwind's massive fleet of privately-owned hoppers), so my kitbashed Walters mine is Eureka 43. The time is July 1956, the last full year of steam operations on the PRR. Diesels, trailers on flat cars (TOFC), and track reductions are starting to change the image of the mighty Pennsy but some of the past is still very much there, from the wood-and-brick interlocking towers to the freight house with its PRR Merchandise Service trucks parked out front. My version of the Middle Division has two instead of four tracks, but the spirit is there even if the space is not! Even in 1980, Conrail was still using three tracks, so I'm still a little behind. The layout is built on a 36"x80" and a 24"x80" hollow-core door with folding, telescoping H-legs These legs were purchased on-linehere. The scenic base is 2" extruded Styrofoam. Scenery is Styrofoam with Sculptamold. Rockwork is Mountains-in-Minutes flexrock castings. Ground cover comes mainly from Woodland Scenics, although I've used some natural dirt I sifted and "baked" myself. I used Atlas code 80 flextrack with Peco Insulfrog code 80 turnouts on the original part of the layout. Minimum mainline radius is 13.5" and turnouts are #8 on the mainline and #6 on sidings. Why code 80 and not that beautiful Atlas code 55? This layout has to move with me every few years (I'm in the Air Force) and go with me to shows where it will take a beating. I just felt the code 80 had a better chance of surviving! However, the rail height and oversized ties as well as the unrealistic rail profile bothered me to the point that I used Atlas code 55 on the new extension. I'm very glad I did. I'm using the Digitrax Super Empire Builder DCC set. Yeah, I know, it's more than I need for such a small layout, but (see above) I plan on using it later some day on the "big one." Wiring is 14 AWG solid for the track bus, 24 AWG for the feeders, and 18 AWG stranded for signaling. Signals are NJ International PRR 8-bulb position light signals (some absolute stop, some permissive). Mainline signals are fully animated using Logic Rail Technologies SAD-3 Signal Animators. Read about how they work here. Sidings have toggle switches allowing them to be manually controlled between stop and clear aspects. Signals are powered by a separate (MRC Tech II) DC power pack. I've recently acquired some Alkem Scale Models scale-sized LED position light signals, and I plan on installing them someday. Freight cars are a mix of Bowser, Atlas, Micro-Trains, and Intermountain. New additions include Eastern Seaboard Models, Bluford Shops, and Walthers. All have knuckle couplers and have been weathered. Cabin cars (cabooses for the non-SPF) are Bowser N5 and N5C, two of which have Trainphone antennas added. Passenger equipment is a vast array of Atlas, Rivarossi, Hell-Gate Models, Lima, Intermountain, and Con-Cor. All have a Pennsy, Conrail, or Conrail-predecessor prototypes or have been modified (like the P70) to match one. No $100+ craftsman kits or 9-month scratchbuilding projects for me when one clumsy hand at a show or drop during a move could end it all! Few of my railroad structures are actual PRR prototypes (most come from Atlas and Walthers), but I find with the correct two-tone brown with red window sash scheme and proper PRR signage (via PowerPoint and a photo printer), they do a "good enough" job. Again, someday I plan to invest in accuracy when I build a more permanent layout, but for now, I rather enjoy making commercial kits look Pennsy (or at least less like everyone else's!). I have the Micro-Mark car routing system so that I can operate using waybills and car-cards. For now, I'll probably stick with simple sequence operations, although I do have a fast-clock capability with the Digitrax system. My initial plan would involve east- and west-bound locals dropping off and picking up at Lewisport, a Lewisport job, a mine turn, and a passenger train. The passenger train can be swapped out some sessions for a hotshot freight, such as a TrucTrain. My hope is to keep two or three people occupied for a 30-60 minute session if possible. The recent addition of Enola Yard makes operations far more promising.